I double booked myself for classes the evening of this class, which is something I try hard not to do. I keep all of my classes in Google Calendar to help prevent this. 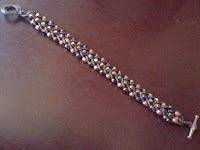 The class was taught by Claudia Cola at Sea of Beads. 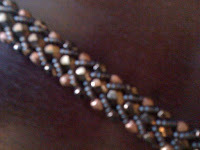 The braided bead bracelet takes on a ton of different looks depending upon the beads you choose. I was going for a dark earthy look. I'll try to get a pic of Emmy's piece to show the different looks that can be achieved because she used crystals and pearls with a red and white theme, very beautiful but extremely different from mine. She had some difficulty if memory serves me because of the number of passes you need to make with the thread and the size of the drill holes typically found with pearls, but she made it work. You'll be amazed that they are the same pattern, I'm sure.